Basically, it is a bed that is on hinges and can be stored vertically or horizontally in a wall unit. It is a great alternative to a full guest bedroom, and still allows you to have guests without the commitment of using up an entire room as it folds up to allow to use the room for other purposes. Other common names for a murphy bed are pull-down beds, wall beds or fold-down beds. Where did it’s name come from? Like any great inventor, the father of the popular wall bed, William L. Murphy named his invention after himself. The creation of this space saving marvel has quite the romantic origin. In the 19th century, William Murphy lived in a one-room apartment in San Francisco and wanted to court a young opera singer. But the norms of the time did not allow women to see inside a man’s bedroom if not married to him. Murphy did not want to loose his chance at love, so he created the murphy bed to stow his bed in the closet in order to make his one-room apartment into a proper parlor. The age old question from anyone who has had to sleep on a pull out sofa bed, are wall beds comfortable? And the answer is yes! They are very comfortable because unlike a very uncomfortable sofa bed, you get to choose the mattress and the size of the mattress! This depends on the hardware used to pull down the bed. McCabinet uses a special mechanism with a hydroponic piston that will seamlessly pull down the bed and safety on top it’s stand. Not all wall bed hardware is created equally. Some may spring back up because it is too tight and others may be terrible to put back into place because it is too loose. This depends on your space. 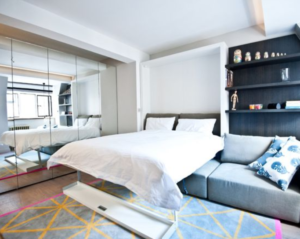 If you have a sprawling single family home, but still do not want a designated guest room, installing a murphy bed in an office, library or even a separate living room space are the perfect spaces for a guest “bedroom”. Now that you have some background on the infamous bed in a wall, which will you choose? A standard vertical pull out bed or a horizontal tilt? In my opinion, a side tilt works best for a twin bed and a larger bed with the standard vertical style. This is a very important feature in a closet. It’s how you hang all your clothes so you need the proper amount of room. The first rule of thumb when planning your closet is at least 48″ of rod length. Including a vanity within your closet optimizes storage for other garment, while helping to eliminate other furniture in the sleeping area. Although adding in a vanity is often times a feminine feature, with the right color and finishes, it can be made very masculine. Lighting is very important. Probably one of the most important feature in your closet. With the right type of light you will be able to see the true colors of your clothing and other accessories. If you’re lucky yo have high ceilings in your closet, adding two levels of rods will maximize vertical space resulting in as much usable space as possible. Add built-ins that go up to the ceiling for seasonal type items you do not use as often and include a sliding ladder to access these items. This one seems like a no-brainer, but add a full length mirror. It may make your space feel bigger and it’s always a great feature to add to the perfect closet. 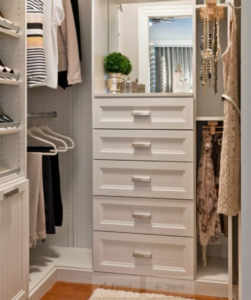 There is a lot to add to a closet to make it perfect, but don’t forget to add in your own personality! Installing amazing wall paper or photos to the walls will really make it feel like yours! If space allows, add a nice chair or lounger! It’s a great addition to closet, for style and function. At the end of the day, have fun designing your closet. There are not “rules”, just guidelines for a well-rounded closet. Tis the season for realizing how unorganized your garage is! Around this festive time of year when all of the holiday decor is revived from the mountains of boxes in the garage you begin to realize what you forgot from last year, that your garage needs to be cleaned out and organized. But the problem is, there is so much stuff and you do not know where to start. Before diving in head first, come up with a plan of attack. 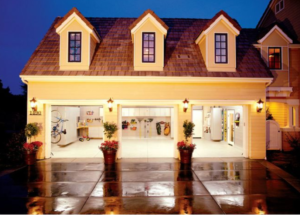 Envision what you want your garage to look like. Is it for sheltering the cars? Is it a work shop space? Or simply just organized storage. Day 1: Purge Purge and Purge! Before getting started, set up areas such as for hazardous waste, garbage, recycle, donate, sell and finally what you want to keep. Once you have the zones in order. It is important to take everything out of your garage in order to organize it. Do not try to organize while in your garage, the point is to take everything out and carefully put things back that you will use and want to keep. Organize what you’re going to keep into categories. For example, gardening tools go with other gardening items and so on. Remember, if you have no idea when the next time you’ll use it, get rid of it. Most garages are not the cleanest rooms in the home so inspect it for unwanted critters and clean the floors from debris and oil stains. Start decluttering by exposing of oddly shaped boxes and broken containers and buy new, sturdy plastic containers. To make items easier to find, use different colors labels. But remember not to mix contents, keep like items together. Draw up a floor plan for where each container will be stored for easy access. Or if you are looking for something on the high end side, a built in garage cabinet unit will make storing everyday items accessible and leave the plastic containers for the holiday decorations. Storing containers and other items like ladders invite mildew and water damage and will make your garage susceptible to become messy again. Rather, use all the wall space available to store working items and shelving for containers. Don’t keep all the non-keepers in a pile in the garage, finish the job done and plan a yard sale and donate items to a charity. 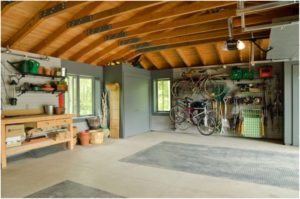 Your garage is still part of your home, so make it feel as such by creating an entrance for shoes, coats, etc. Make the entrance area just as appealing as the entrance to your home. When planning for a new kitchen the hopes of a perfectly organized pantry is high on the priority list. 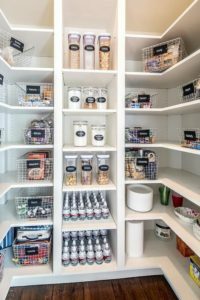 There are endless options for inserts and other organizational tools to gain the most amount of storage space in a pantry, but which what makes the difference between a pantry that looks organized versus one that is actually functional? Pull out pantries and spice pull out are great, but if you are a seasoned spice user in the kitchen, small items like these can get lost. 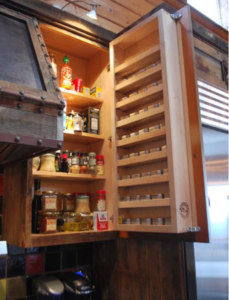 The best item to buy and install is a door-mounted spice shelf. It’s a great solution to keep the most used spices in an area where they are seen and convenient to get to. Keep the staple items like cereal, pasta, snacks at eye level. If you have kids, keep their favorite snacks at their height for easy access. One of the biggest lessons in pantry learned very quickly is the unnecessary amount of containers for almost every item. The best food items to put in air tight containers are baking ingredients like flour and sugar. Do not make the mistake when you go for the baking ingredients in the canister using too much sugar instead of flour! Invest in labels for those air- tight containers. It may be time consuming based on the amount of containers, but worth it. Round items such as onions and potatoes can be stored in wicker baskets at the bottom of the pantry will eliminate clutter on the counter and fridge. Items like potato chips, oddly shaped bags and extra ketchup bottles belong towards to bottom of the pantry to prevent mess from an exploding chip bag and store extra items.